Yorkshire batted well beyond the lunch interval on the final day of their last warm-up match against Leeds/Bradford MCCU at Headingley, leaving themselves too little time to force a win against a fiercely determined University side. Already a considerable way in front overnight, Yorkshire started the morning session in a comfortable and unhurried fashion with Richard Pyrah and Tim Bresnan seeing off the early overs. 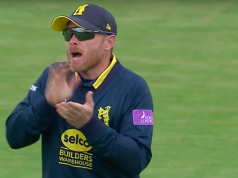 A shift in the pair’s mentality became clear when Bresnan clubbed two fours off the spin of Joe Ellis-Grewal and Pyrah started going for his shots as well, including a straight drive for six, again off Ellis-Grewal. Bresnan was then out for 38, slapping a loose delivery to cover for the second time in the match. Yorkshire kept on batting, despite their lead swelling over an already-improbable target of 300. The young slow left-armer Ellis-Grewal stuck to his task and bowled with discipline and control throughout a long spell. Any counties on the lookout for a young spinner would do well to keep an eye on how he progresses this season. Karl Carver was caught behind after the lead passed 350, but Steven Patterson and Jack Brooks put on 50 runs for the final wicket to remove any chance Leeds/Bradford might have had at the start of the day to pull off a surprise win against the 2014 County Champions. Brooks scored 36 of his 38 runs in boundaries in the second innings; one of Yorkshire’s great strengths in their Championship-winning season was the contribution of lower-order players with the bat, and the early indications are that they will continue that tradition this year. Given just over three hours to bowl out the MCCU side, Yorkshire’s bowlers made the early inroads they struggled for first time out. Bresnan extracted enough movement with the new ball to have Henry Thompson caught at third slip, before Brooks squeezed one through Billy Root’s defences to leave the visitors reeling on 10/2. Leeds/Bradford then set out their stall to defend, but Carver enticed a drive from Logan Weston to a cleverly-placed fielder at short extra-cover to give his side a big chance of forcing a result going into tea. Twenty minutes into the final session, Carver struck again when opener Steve Bullen stepped back to a full delivery and was trapped lbw. Harry Rouse and George Scott both held firm against Carver and the seamers, who were bowling to fields packed with close catchers. Based on the evidence of this fixture, the lack of an aggressive spinner like Adil Rashid who can bamboozle tailenders and finish teams off quickly will be a big challenge for Yorkshire in the first three matches of the season. They have demonstrated their depth in batting and seam bowling, but they may yet go to New Road on Sunday without a front-line spinner. That will depend on whether Carver has shown enough promise in this match to convince Jason Gillespie that he is worth a spot in a side where places are still hotly contested in spite of their six England absentees. The students of Leeds/Bradford can now proudly say that they have held the County Championship title-holders to a draw on their home turf, and they deserve a lot of credit for their performance. While they never looked on top, they had Yorkshire in trouble at times and just lacked the quality and depth to trouble their professional opponents in key passages. The debate about whether MCCU games should have first-class status will never go away, but the Leeds/Bradford students provided Yorkshire with a sterner test than many counties managed in 2014.